People are seen at the CNE in Toronto, on Sunday, Aug. 19, 2018. The president of the union representing the workers locked out of Exhibition Place says the talks scheduled for today with members of the board of governors have been called off. Justin Antheunis, president of the International Alliance of Theatrical Stage Employees Local 58, says he received an email late on Saturday evening saying it was too late to schedule a meeting, although he says there was one already scheduled for 10 a.m. He says the city negotiators are bargaining in bad faith and are nto interested in reaching a new deal. 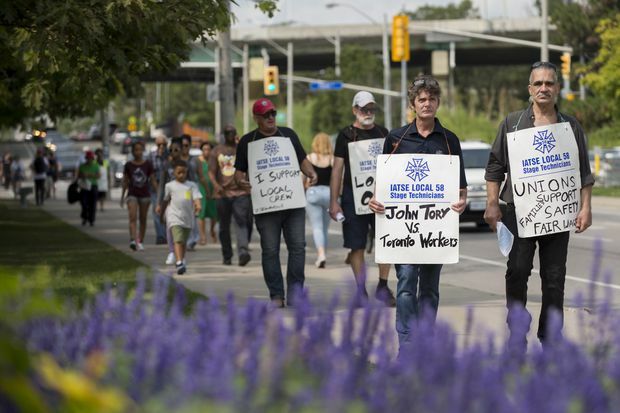 Picketing workers from the International Alliance of Theatrical Stage Employees (IATSE) walk the picket line in front of the Canadian National Exhibition on Sunday, Aug. 19, 2018. The labour dispute between the two parties has led to picket lines outside the annual CNE, and the CEO said the dispute could cost the fair more than a million dollars. A spokesperson for Exhibition Place’s board of directors did not immediately respond to a request for comment.